What Can We Do for the Forest and Wildlife of Indonesia? There are many simple actions that we can do for ourselves, to take part in the forest and wildlife conservation effort. Stop thinking that taking actions means doing big things, takes a lot of money, or it has to look fantastic. Small actions could be more meaningful than big talks! Our knowledge about nature conservation has to be comprehensive, but we have to put that knowledge into real actions. Concern and empathy is not enough. Now is the best time to take inexpensive local or small actions. 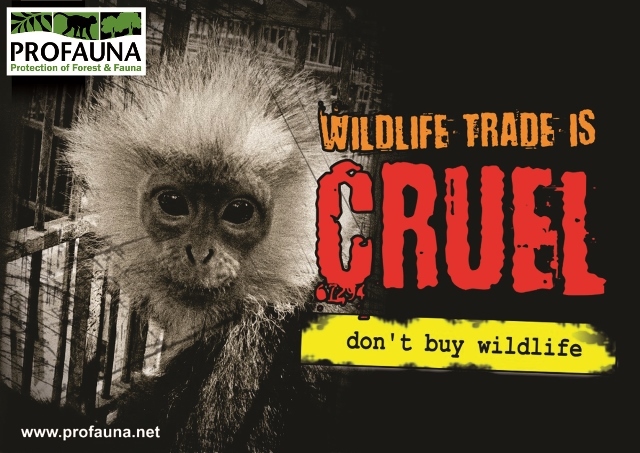 Do Not Purchase Wildlife and Their Products! Most of Indonesian wildlife sold in the illegal markets is captured from the wild. More wildlife in the markets means more have been forcefully taken from their natural habitats, and more species are getting closer to the brink of extinction. By not purchasing Indonesian wildlife and their products, you have contributed to their conservation. Not only the poor wildlife is being sold alive to be kept as pets, their body parts are also sold as souvenirs or decorative stuff. Please be aware when buying souvenirs in tourism areas for they might contain wildlife body parts (or its derivatives). Do not buy such product, unless you want to support illegal poaching in the wild. If you encounter an illegal act of wildlife trade in Indonesia, please report it to the police of to the Nature Conservation Agency of Indonesian Forestry Department. If you find it too difficult, you can also contact PROFAUNA by email to: profauna@profauna.net . it would be great if you could send a photograph to accompany the report, along with the time and location. We would then try to deliver the report to the authority. Another thing you could do when you encounter illegal wildlife trade or forest destruction acts, is writing about it and send it to newspapers. The more you write, more likely the issue will be addressed by the concerning authority. Spread the information about forest and wildlife conservation to your networks, including through you social media accounts like Facebook, Twitter, etc. Start educating the people around you, your family, and your friends because the more people know about this issue, the bigger the impact would be. Join PROFAUNA's network on Facebook by "Like"-ing our fan page, or follow our official Twitter account @PROFAUNA, to get information updates related to the conservation of forest and wildlife in Indonesia. After getting the updates, do not forget to share it for everybody else to know! Thousands of people from various backgrounds have shown their concern for the conservation of forest and wildlife in Indonesia by being PROFAUNA's Supporters. By being our PROFAUNA's supporter, you can get regular and updated information about wildlife issues, and more importantly you could meet other people who share the same concern with you. The conservation efforts of forest and wildlife would never be optimal without your support. You could help by giving donation, and it is not about the amount of money you give because the smallest support could mean a lot. With the donations, we could do more things to help the wildlife and their habitats.